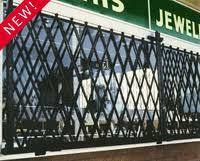 Security Gates for windows are designed to offer a more firm and protected storefront security gate for windows. Bottom track steel window gates are installed along the inside of retail store windows utilizing a unbroken frame effect for structural strength and steadiness. Keep you business safe after hours with folding window security storefront gates. Our metal gates pivot 180 degrees on their mountings – they pivot out of the doorway and move back and forth to a flat position and remain practically unseen while not in use. For additional firmness, bottom track designs can use an H” bracket when locking two gates together. 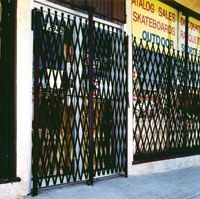 Our metal gates for store front windows will stand up to all weather conditions like heat, rain and snow and they won’t be hurt by harsh commercial chemicals and cleaners. Our galvanized window Gates are nearly maintenance free, offering the best in security with a lower cost of ownership. All gate orders come with brackets, bearing washers and casters for easy and complete installation. Tampa Bay Security Gates can be customized to fit any security need. Window security gates can protect a single access point or provide a complete front-line wall of security.